State Counsellor Aung San Sun Kyi’s National League for Democracy (NLD) administration in Myanmar has been heavily condemned by international policy analysts for its absent economic vision and lack of a tangible policy on minority management. But it seems now there is a plan: Suukyinomics, a brand that began with the announcement on 28–29 January 2019 to amend the 2008 military-backed constitution. Suukyinomics is built on the rule of law and institutional economics. It consists of two broad plans. The Myanmar Sustainable Development Plan (MSDP) aims to achieve a peaceful, prosperous and democratic country. The Myanmar Investment Promotion Plan (MIPP) aims to transition Myanmar to a middle-income economy and persuade foreign investors to part ways with US$200 billion over the next two decades. The MSDP is structured around three pillars, five goals, 28 strategies and 251 action plans. All are firmly aligned with the United Nations’ Sustainable Development Goals and the 12 Point Economic Policy of the NLD government. The MSDP aims to institute strong macroeconomic management and good governance, prudent fiscal discipline and the maintenance of a fiscal deficit no more than 5 per cent of GDP. The MIPP aims to integrate domestic and foreign investment promotion in line with the directions of the National Comprehensive Development Plan (NCDP) and the Investment Policy of 2016. The MIPP also aims to improve the business environment — by 2020, Myanmar’s rank in the World Bank’s ease of doing business index should drop to below 100. The Investment Promotion Committee (IPC) will be established to facilitate implementation of the MIPP and is chaired by U Soe Win, the Union Minister of Planning and Finance. Whether it will be a success depends on the effectiveness of Myanmar’s 1.8 million bureaucrats who continue to be criticised for the quality of service delivery. The government of Myanmar is the largest employer in Southeast Asia and its union civil servant board (UCSB) is unnecessary — it is militant and has inflexible business practices. There are three shining spots to be found in the NLD’s economic reform during the period 2016–19. The first is related to the rule of law. Anti-corruption efforts have been particularly successful. President U Win Myint’s recent dismissal of ex-advocate general of Yangon Han Htoo and ex-lieutenant colonel Yan Naing Tun represent a milestone in the recent five-decade history of judicial practice and public administration. U Win Myint and the NLD’s senior leadership have done well to clean up tainted politicians even within their own party, expelling elected members accused of misuse of entrusted power for private gain. The NLD has also made successful gains in modernising the Central Bank of Myanmar (CBM). After being heavily criticised by local banks and the private sector for unseating the governor of the CBM U Kyaw Kyaw Maung, reformers U Soe Thein and U Bo Bo Nge were appointed as deputy-governors of the CBM with the remit of correcting institutional difficulties. The CBM is vigorously stabilising the economy by controlling inflation, reducing the money supply and regulating its money and financial markets after issuing the Burmese Way to Basel Regulation in July 2017. The CBM-floated foreign exchange rate now permits 13 foreign banks to loan project financing and trade financing. Recently, the CBM allowed for the Japanese yen and Chinese yuan to be used as convertible currencies to tackle the dollarisation of trade at Myanmar’s borders. In contrast to previous administrations, the reference exchange rate of the kyat for account transactions against the US dollar and other currencies is released daily on the CBM website. A financial stability report and Myanmar’s monetary report are released periodically. The third shining spot is infrastructure. Roads are being built and rail tracks upgraded nationwide. Some of Myanmar’s coastal areas and border trade routes are also undergoing development thanks to Chinese investment. According to Aung San Suu Kyi, it is the right time to invest in Myanmar. Still, provision of meaningful assistance for the stateless people of Arakan, Kachin and other minority groups in Myanmar’s border regions remains unaddressed. Suukyinomics itself is ambitious and its outcomes will be tested in coming years as the NLD attempts to amend the militarised 2008 constitution. Whether the NLD remains in power come 2020 will partly depend on Aung San Suu Kyi’s tactical skill, strategic manoeuvring and the success or otherwise of this new economic plan. Naing Ko Ko is a PhD Candidate at the Regulatory Institutions Network, College of Asia and the Pacific, The Australian National University. 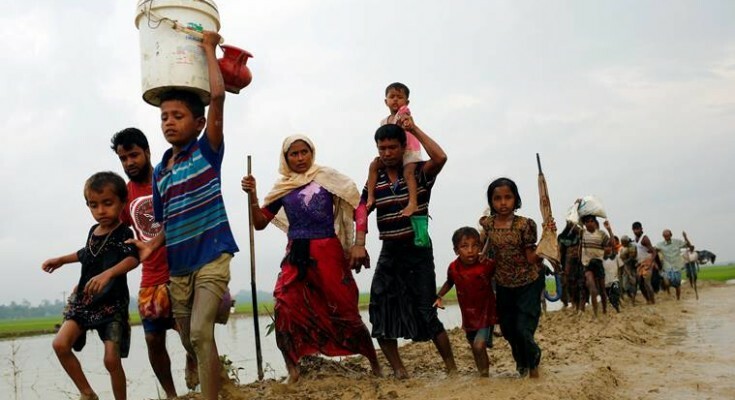 This entry was posted in ASEAN Economic Community, China, Democracy, Economic Policy, Freedom, Myanmar, Rohingya Refugees, Rule of Law, www.eastasiaforum.org. Bookmark the permalink.